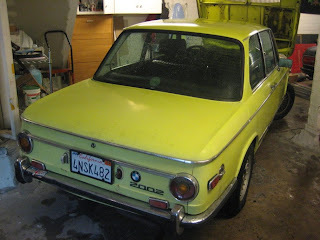 It's Golf Yellow (original factory color, though several panels have been resprayed) with a nice black interior. I have some more photos of it over here. The car suffers from some typical "previous owner painting some parts black" and "poorly-done stereo install" issues but is otherwise nice and original. In the near future, it will be my friend Aron's car (and will replace his large brown diesel Mercedes) so we've been working on it together. So far, we've fixed some minor electrical problems, both door locks, replaced the aftermarket radio and its associated wiring with a nice factory Blaupunkt unit, and cleaned up the trim and interior pieces. Aron also brightened up the tail lights by repainting the inside reflectors with a fresh coat of chrome paint. I'm maintaining a TODO list of things that need to get fixed or replaced and am happy to see it getting shorter! Very nice! I just got myself a 69 NK 2000. Are you by chance the administrator of the Neue Klasse forum? I registered there, but I am unable to post. Whenever I am logged in, the site says "no forums available" and the UI design is slightly different. Not sure what is going on, but I would love to be able to interact with that community.